As Bob nears the completion of his painting (all that's left is to dampen the color of the white dots so they aren't so bright and then add in all of the black paint), I look to how to best complement it with mantle decor. Since we moved in last October, our fireplace has been host to Halloween, Fall and Holiday decor. I haven't had to worry about a year round option until now! Months ago we decided on a color scheme of ice blue, berry and grey for this library/sitting area. The comic book inspiration for Bob's painting had similar shades. On another note, I am in the middle of making a grey shag rug out of a couple dozen cut up white t-shirts (a pinterest find). Cross your fingers this rug turns out well! We have been keeping our eyeballs open for the perfect two chairs. 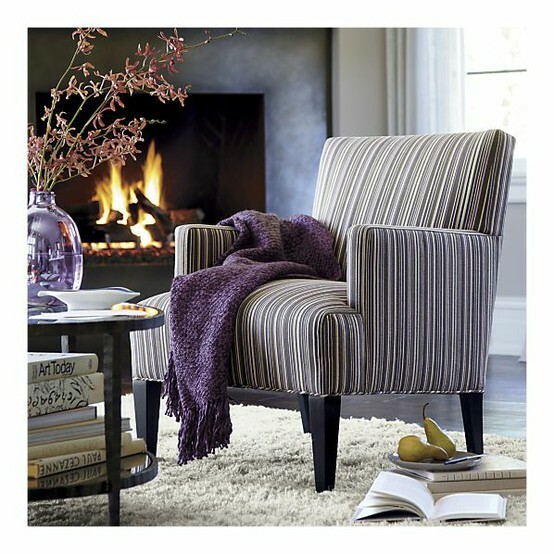 This beauty from Crate and Barrel made us look twice, but the price tag of $900 might be a little beyond what we are willing to shell out! As for mantle decor, I brought out the vase filler thumbtack balls I made this summer (another pinterest find, check out my how-to here) and also snagged some dried eucalyptus that has been at home in this same white vase in our bathroom for the last two and a half years. I love the layering the branches add in front of the painting! I should also note that the plan is to hang the painting, not just lean it against the wall, so we'll have a little more brick background at the base. We have these three black candlesticks, but no candles for them just yet. I'm not sure if they will be staying put above the fireplace or if we'll find a different option to jazz up the space. Only time will tell. So while I can't say just yet that the mantle is a finished product, I am very pleased at how it is coming along! We'll also likely paint the fireplace, but what color???? May I suggest you not buy chairs until after your wedding? Just a recommendation I give all my friends about to get married. It looks like your doing a pretty good job, I can't wait til it's done. May I say that you have a wonderful taste in furniture, the color combination and all those patterns really mix well. Interesting to see what the painting looked like at that stage.